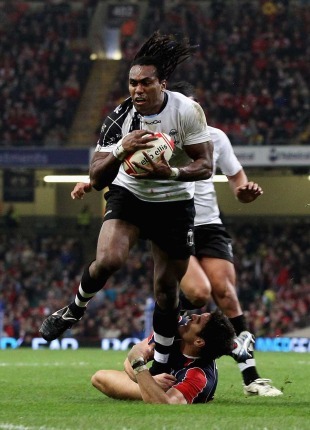 Fiji travel to face Italy in Modena on Saturday looking to build on last weekend's draw with Wales in Cardiff. The tourists' gutsy display caused shockwaves in Wales and Italy will have been put on notice by the blend of pace and power they exhibited throughout the 16-16 stalemate. Italy have selected a powerful pack in the hope of stifling the visitors and there could be a classic encounter of flair versus power in store. The Azzurri have endured a difficult November to date with losses to Australia and Argentina and can little afford to concede further ground heading into World Cup year. Italy - Player to Watch: Salvatore Perugini has been restored to a heavyweight Italian pack with scrummaging on their mind. Fiji have looked a decent side in recent weeks but have shipped penalty tries against France and Wales, and it appears that the home side are going to go for the jugular at the set-piece. Italy - Team News: Perugini's recall is one of three changes, with Robert Barbieri returning in the back-row after a try-scoring cameo against Australia and the experienced Andrea Masi replacing Tommaso Benvenuti on the wing. Fiji - Player to Watch: Seremaia Bai's boot was king in Cardiff a week ago and the Castres playmaker has brought structure and calm to his backline so far on tour. If he decides to open things up further this weekend then there could be some casualties in the Italian backline. Fiji - Team News: Bai's surprise inclusion comes following an injury to Exeter's Josh Matavesi. Norman Ligairi takes the fullback berth as a result, with Napolioni Nalaga also restored to the back-three in place of Michael Tagicakibau. In the pack, Gloucester's Akapusi Qera is recalled for the injured Malakai Ravulo. Key Battle: The Italians may be looking to put the squeeze on up front and much will depend on the visitors' handling should they secure possession. Italy need to offer something in response to Fiji's backs - their pack alone will not do the job. Trivia: While not in the squad this weekend, Italy No.8 Manoa Vosawai was born in the Fijian capital, Suva. Stats: Ligairi needs one try to draw level with Viliame Satala at the top of Fiji's scoring charts against Italy - he currently has two from three meetings. Prediction: Fiji have proven themselves to be a tough nut to crack in recent weeks and with their backline bolstered by some big hitters Italy will struggle to contain them out wide. Italy's salvation could be their pack but if Fiji get enough ball then they should nick it.